The MVfemto series modules are the smallest line lasers with outstanding optical power for industrial image processing. With dimensions of 40 mm in length and 8 mm in diameter, these modules are best utilized in 3D sensors that have very little space. The MVfemto lasers comprise a fixed focus set at factory level either in the standard housing, in a version with separate housings for the optics and electronics, or in a short housing without a laser driver. Click here to download the datasheet. 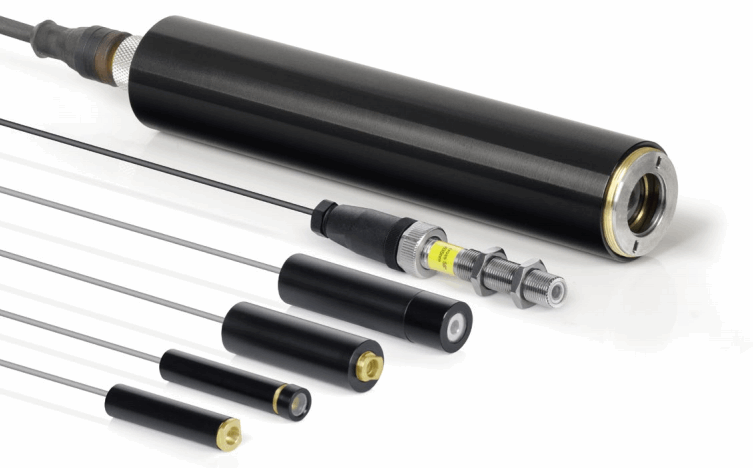 The MVpico series of laser modules have an output power of up to 100 mW and are only 50 mm long with a diameter of 10 mm, making them suitable for integration into intelligent 3D vision sensors. The modules can be ordered with the new Edition 2017 focusing mechanism for simpler and more precise focus adjustment, as well as several optics options for different combinations of line thickness and depth of focus. Models versions can come with an adjustable focus or a fixed focus set at the factory, and with separate housings for the optics, electronics, and a version without driver electronics. Click here to download the datasheet. The MVnano series is considered the standard image processing laser series for the majority of image processing applications. The 61 mm x 11.5 mm housing makes these lasers suitable for stand-alone products or for integration in very different applications. The new Edition 2017 focusing mechanism is available for simpler and more precise focus adjustment. Several optics options are also available for different combinations of line thickness and depth of focus. Different versions can come with an adjustable focus or a fixed focus set at the factory, and with separate housings for the optics, electronics, and a version without driver electronics. Click here to download the datasheet. The MV18 series of robust and versatile modules may be integrated into many standardized applications via an M18 thread. With a M12 connector and output power levels of up to 200 mW at 450 nm, this line laser is the strongest model in the MV series. The new Edition 2017 focusing mechanism is available, as well as a number of optics options permitting different combinations of line thickness and depth of focus. An inexpensive version is offered with a fixed focus. Click here to download the datasheet. For an overview of these and other available MV laser modules, download the brochure above.